We’re taking FLOW closer to you! Learn the art of FLOW… in THE CITY on Aug 4, Saturday at Beyond Yoga Studio 3rd floor Il Terrazzo Building. Get a full-day FLOW from a wide range of activities to choose from. For the very first time, the FLOW group will be inviting guest speaker, PJ Lanot to conduct an NLP workshop for Better Communication and Motivation. Neuro-Linguistic Programming (NLP) is the art and science of how people can will themselves and inspire others to excellence through proper encoding of information and communication. NLP is all about empowering yourself to achieve the change you want for better results in life, work, and relationships. The famous life coach, Tony Robbins is deeply influenced by NLP and introduced this concept in the book “Unlimited Power”. 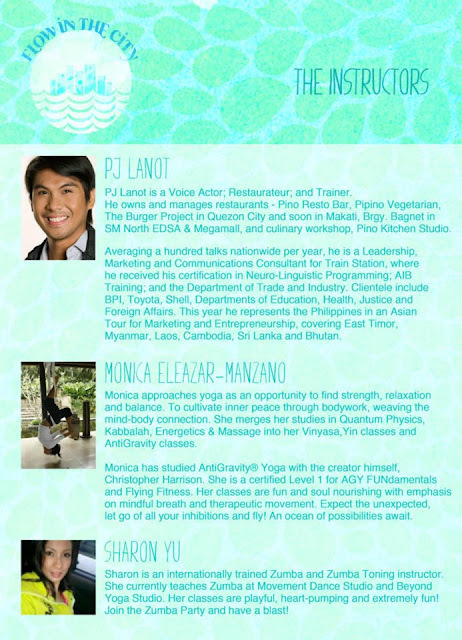 FLOW’s resident yogini, Monica Eleazar-Manzano will be conducting an Anti-Gravity FUNdamentals class. In an Anti-Gravity Yoga class, students will learn to fly, hold and balance in challenging yoga poses longer, gain better kinesthetic awareness, build cardiovascular and muscular strength, become more flexible, increase joint mobility, decompress the vertebrae of the spine and utilize the agility you’ve gained from yoga to play with gravity! Get your party-on with Sharon’s heart pumping, calorie burning Zumba session. Sharon Yu is a certified Zumba Dance and Toning instructor through the Zumba Academy in California. Remove blockages and let loose with the Inner Dance facilitated by the FLOW group. This is an energetically charged, free-flowing dance and healing modality which is being taught and practiced in Bahay Kalipay, Palawan. 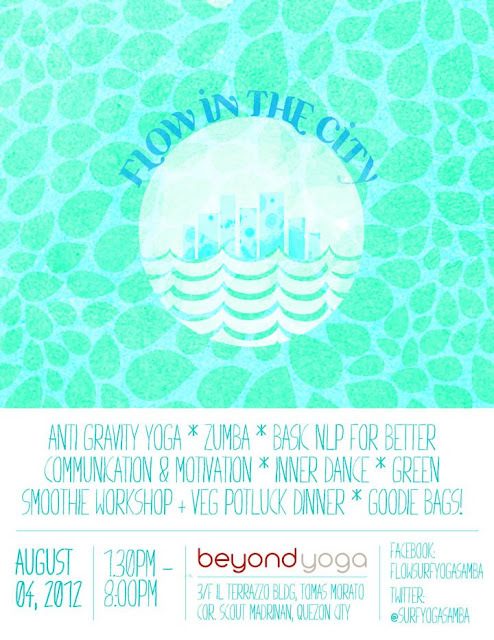 Absorb the sun’s light through a Green Smoothie seminar by the creative brains behind Sunshine Daydream and Rawlicious plus mingle with kindred-spirits during the Vegetarian Potluck dinner. A full-day package costs P1,999 which includes a tote bag with goodies from sponsors. You may also just choose your own preferred activities with a minimum of two classes to join. 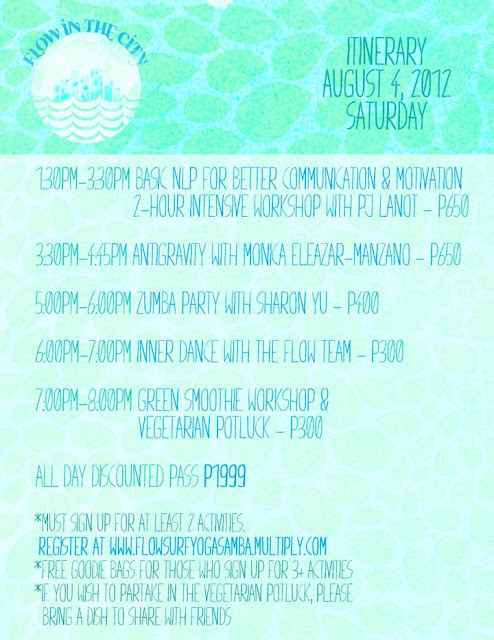 To register please log onto www.flowsurfyogasamba.multiply.com or email us at flowsurfyogasamba@gmail.com.